A organic soy candle that contains a proprietary blend of essential oil extracts from plant and flower families of Zingiberaceae, Genera origanum, Lamiaceae, Rutaceae genera, Salvia officinalis, Labiatae, and Lauraceae known to kill bacteria and viruses. 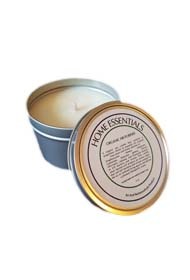 This candle when burned will produce an aroma vapor that will kill bacteria and viruses present in the air of confined living spaces and deliver a pleasant therapeutic scent. Adding a few drops in bath water also aids in the relaxation of score and aching muscles and joints. Why use the Organic Air Purifier? Majority of the air disinfectants that are on the market use chemicals that may not be harmful in small quantities, but the over exposure may cause some short-term and long-term side effects. Some of these chemicals may also trigger potential reactions such as rashes, asthma attacks, and headaches. The Home Essentials Organic Air Purifier while disinfecting the air has no known harmful effects to the human body. Also, the aroma aids in stress relief, and may help soothe headaches and asthma attacks.